Will Philly Have a New Iconic Landmark on Logan Circle? 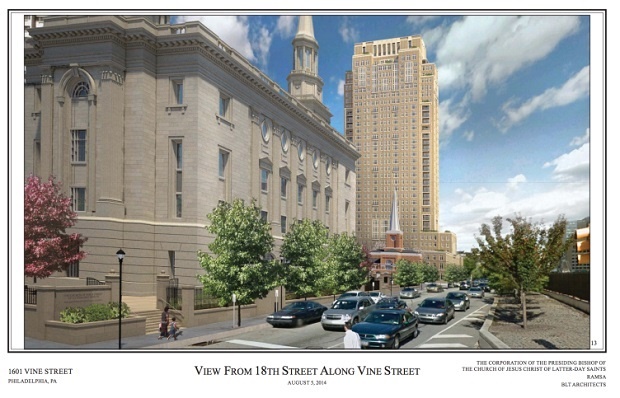 The Philadelphia City Planning Commission’s Civic Design Review committee heard about the plans for the Mormon meetinghouse and an adjacent highrise apartment building at 1601 Vine Street, across Franklintown Boulevard from the under-construction Mormon Temple. 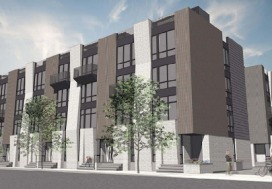 The Church of Latter Day Saints is developing the meeting house for local Mormon parishioners and the adjoining apartment building, on 16th Street, for residents from the general public. Architect Sarge Gardiner, of Robert A. M. Stern Architects, gave a detailed presentation. Robert A.M. Stern Architects designed both buildings, along with BLT Architects. The LDS Church will build both buildings by right, meaning that a zoning variance will not be necessary. The site at 1601 Vine Street is in a Philadelphia Redevelopment Authority district for the Franklintown neighborhood, and must receive approval from the PRA for its design, as well. The LDS’s attorney Peter Kelsen stressed this fact several times. Mr. Gardiner said that the tower will be 32 stories and 359 feet tall, with a slight setback above the third floor. It will help create a street wall on Vine Street, along with the new Mormon Temple. It will have a north-south orientation, with an “H-shape” layout for the lower floors. This will create a courtyard and circular driveway on the west side, where the entrance to the apartment tower will be. The courtyard will have townhouses along it. On one side, the townhouses will face Vine Street, which will have varied entrances, stoops, and window configurations on that side. The 16th Street side will have retail space wrapping around onto Vine Street. The tower will have 11,000 square feet of retail space. 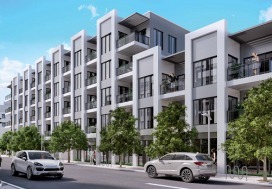 Above the retail space will be amenities space and a terrace that will have a plaza and lounge. There will, also, be green rooves on each roof level. All parking will be underground, with 238 parking spaces, and the parking entrance will be on Wood Street on the north side. The tower will have a façade of beige brick and granite on part of the ground level. The tower will have a traditional Beaux Art/Art Deco design, similar to the Robert A.M. Stern-designed 10 Rittenhouse. 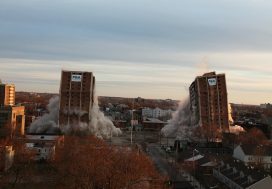 The meeting house will be separated from the apartment tower by a small roadway called “16th and a Half way”. The meeting house will be much smaller than the Mormon Temple and will have a traditional Georgian look with red brick and some granite at the ground level. It will be surrounded by landscaping, including a small courtyard at the corner of 16th Street and Franklintown Boulevard, and a “Sunday Garden” at Wood Street and Franklintown Boulevard. The Sunday Garden would have trees and flowers, but it would not be open to the public. The meeting house would be 24,000 square feet and would have a chapel and recreational space, among other things. There was some discussion about the art. The committee members wanted to know what sites would have the artwork. The architects weren’t sure, but they pointed out the potential sites would be the open space, along 16th and a Half Way, and maybe the paving itself. The architects said that an art consultant had been hired and that a plan for the artwork would be ready by January or February. Committee member Cecil Baker pointed out that with the location and cost of the project, that this is a rare opportunity for great artwork that should be exploited to the fullest and planned accordingly. Peter Kelsen said that the project should start by the end of October, depending on whether they can complete the agreement with the PRA by then. The LDS and architects are hoping that the meeting house and tower will be “an iconic landmark” on Logan Circle.